T-shirt available from Restore Australia. Halal food seems to be everywhere these days. It is food containing meat prepared by Muslims in accordance with shari’a law. 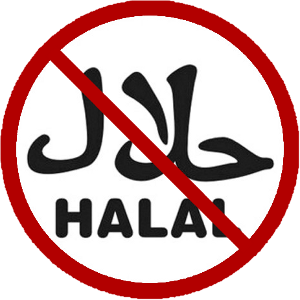 Other foods that do not contain meat are often certified halal as well. 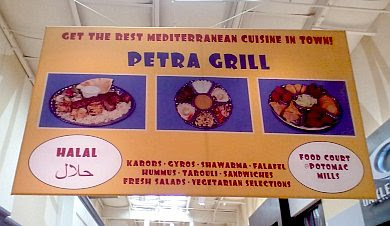 The Petra Grill, as in Petra, Jordan. Halal food has now arrived at Potomac Mills Mall. And how many of those thousands of shoppers know what “halal” means? How many would even boycott the mall or protest if they did know? And why do so many still insist that there is no Islamization of America? This monster is staring us in the face, ready to devour us whole. Get up and do something about it! Support ACT! for America. Why should non-Muslims care about halal food? Here is WHY non-Muslims should care about the introduction of any halal food into the West. I read a great anti-halal essay that explained that halal food contributes to four significant problems – independent of animal cruelty or religious issues. The first problem is an employment fairness issue. Halal slaughter requires that Muslims perform all halal rituals. The end result is that Muslims begin to “take over” food production jobs of a nation. The idea that Muslims – who wish to eliminate non-Muslims – control any aspect of non-Muslim food production is disturbing. The second problem is a terrorist funding issue. All halal products require the monetary purchase of halal certification from a major Muslim entity – and some of that money inevitably supports terror efforts against the West. The third problem is a Muslim immigration scam. Evidently, halal slaughter requires Western nations to import halal butchers from Muslim nations. The scam is that the halal butchers QUIT as soon as they receive their Western immigration status – requiring the constant importation of halal butchers from – you guessed it – Muslim nations. The fourth problem is that – where Western countries have banned guns but allow knives – halal butchers can use their butchering skills as very effective human murderers. In essence, the importation of halal butchers is the importation of devout Muslims who would make extremely effective foot soldiers in a fighting war. In the meantime, halal butchers use their butchering skills to commit violent crimes in the West – halal human slaughters which go unreported by the main stream media. Halal food finances the worldwide jihad! One of the reasons that shariah finance and the halal food industry are flourishing in the West is that there is a lot of money to be made in these fields, by Muslim and infidel alike. Western banks aren’t pushing shariah-compliant mortgages because they’ve suddenly seen the light by reading the timeless verses of the Koran. No, they’ve seen the bottom line: shariah financing is very, very profitable — often more profitable than standard interest-based loans, since shariah loans are subject to a different regulatory regimen. The same applies to certified halal food products. Restaurants and groceries that carry them can expect more trade from culturally enriched customers. Exact figures are hard to determine, but billions and billions of dollars in profits are made at all levels every year by the halal industry. In both of these fields, a shariah-mandated portion of the proceeds must be handed over to the Islamic authorities as zakat, or alms — one eighth of which must be applied to financing jihad. 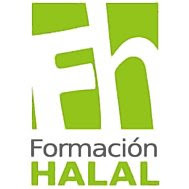 The following course prospectus for Formación Halal (“Halal Training”) comes from the Halal Institute in Córdoba, Spain. This is not a little hole-in-the-wall storefront cooking school, mind you, but a respectable academic institution associated with the University of Córdoba. And don’t forget the symbolic significance of Córdoba for the Reconquista. Spain is now in the midst of a “de-Reconquista”, and the presence of the Halal Institute in Córdoba is concrete evidence of that ongoing process. This is the first course of its kind. There is a bit more at the Halal Institute: halal cosmetics, halal holidays, halal economics, halal ecology, halal TV… and halal placenta for the Muslim woman’s skin. There are sections in English here and there, for example at the bottom of the “secciones” list, at “turismo halal”. Educaislam is a training center sponsored by the Islamic Council and dedicated to the teaching of Islam in its different dimensions (culture, politics, economy, religion, etc.). Society’s growing interest in Islam and Muslim-related issues has made necessary the creation of a dynamic and plural learning environment. Halal is a global concept which refers to a set of practices and conducts which are allowed under Sharia, or Islamic law. Nowadays the halal industry is growing, creating a special demand for qualified personnel in order to ensure the quality in the different stages of the production of halal food. To provide theoretical and practical knowledge on the different phases of the halal food process-lines and production in an industrial context. To provide proper training regarding the maintenance of professional practices and ethical guidelines in order to guarantee the functioning of the halal production line. To make Spanish, European and international halal guidelines known. A structured and partly face-to-face study methodology has been prepared. It includes different module contents which deal with a wide range of aspects from the most general to the most specific ones. Assessments, exercises, exams and practical activities will take place. The course will also have a permanent virtual platform on which discussion forums will be held. An initial and a final face-to-face session will take place in order to comply with the performance of the practical sessions. The course is designed for people with an interest in performing professional activities in any of the stages of the halal production line, such as food-handler, production technician, kitchen manager, slaughterer, butchery operator. The course program will be guided and imparted by experts in Islamic food legislation, scholars of Shariah and Islam, and professionals of the industrial environment. This will convey a kind of learning which will ensure that students receive the tools, documentation and knowledge required to become a specialist in the production of halal food. General instructions, usage of the online platform, resolution of particular doubts and questions of technological aspect. + We recommend that everybody bring a laptop or mobile device in order to get access to the virtual platform during the session. General aspects of Islamic culture and religion. The pillars of Islam. The religious fundaments of halal. Definition of halal, haram and Masbouq. Scope and boundaries of halal. Basic conditions of halal. Application sectors of halal. International perspective of halal market. Requirements and procedures of the halal certificate. The value of a certificate. Tools and practical mechanisms for the implantation of a halal certificate. The handling of halal food. The importance of raw materials. The usage of additives and its limits. Traceability. The risk of cross contamination. Animal welfare in the context of halal, slaughter techniques, most common tools. The importance of labeling. Common features and differences between the European and international norms. Installations of the COVAP [Food and milk products enterprise in Córdoba-Andalusia] in Pozoblanco. Those who have successfully fulfilled all theoretical and practical requirements of the training program and passed the exams will receive by the end of the course a certificate of proof of their degree as a Specialist in the Production of Halal Food. Price: The price of the course is €400. It includes enrolment, learning materials, and the costs of to and from traveling between Córdoba and Pozoblanco. All students will receive a “Halal Institute” grant, which will cover half the price of the course so that students will have to pay only €200. Enrollment: The fee must be paid to the current account number [xxxx] at Unicaja, and clearly indicate the full name of the student and the title of the course. The application must be filled and sent together with the evidence of payment to secretaria@educaislam.com or by mail to P.O Box 2, Almodovar del Rio, 14720, Córdoba. Location: The theoretical session as well as the accompanying lecture will be held at the University of Córdoba. The practical session will take place at the COVAP installations, in Pozoblanco. The virtual sessions will run through the virtual platform of the European School for the training in Halal. The Straight Dope: How come pet food never contains pork? 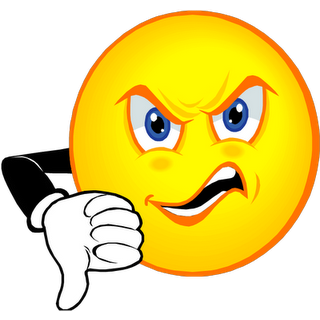 1389 Blog: Filthy Halal Food – Since 1999! Click image for updates on the halal food controversy. French police foil AQIM plot to blow up Eiffel Tower, Louvre, nuclear plant — 1389 Blog - Counterjihad! Dearborn PUBLIC school serves only halal food, offers Islamic prayer breaks — 1389 Blog - Counterjihad!